In yesterday's blog I mentioned John Lennon's Rolls-Royce Phantom V, the car that was later repainted in psychedelic fashion (for complete information on this particular Roller, go to the following website). 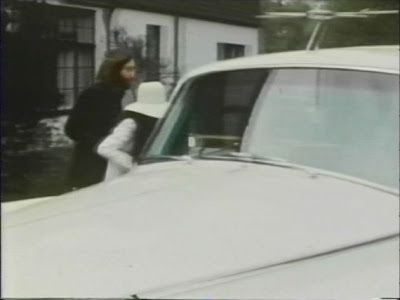 I also said that Lennon didn’t acquire this particular Rolls-Royce until 3 June 1965, and that it was repainted in psychedelic fashion in April 1967. I encourage readers to visit the aforementioned website to verify all of this information. I have brought up this issue because a couple of individuals have emailed me--including a third person whom we actually interviewed as part of our research--challenging my and Rebecca's assertion in our book, Donald Cammell: A Life on the Wild Side (2006), that the white Rolls-Royce used at the end of Performance (1970), the one in which Harry Flowers sits awaiting delivery of Chas ("Hello, Chas! 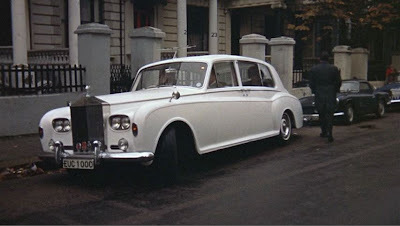 "), and the Rolls in which Chas/Turner rides off in the film's final moments, was John Lennon's Phantom V. It was this same white Rolls, so we asserted, that was later used in the Apple Records promotional video, "The Ballad of John and Yoko" (1969). That could not be John Lennon's Rolls-Royce used in the film, we have been informed, because it was painted in psychedelic colors. The Rolls-Royce used at the end of Performance is white. I responded to these queries by saying that we did our research, and that indeed our information is correct. It is true that three different Rollers were used in Performance: the black one, shown in the film's opening moments; the black Rolls in the garage with a "tasty finish," on which acid is poured, destroying the paint job (actually that Rolls was coated with a clear substance that reacted to the chemicals in the liquid dumped from the jug--that wasn't real acid poured on the Rolls! 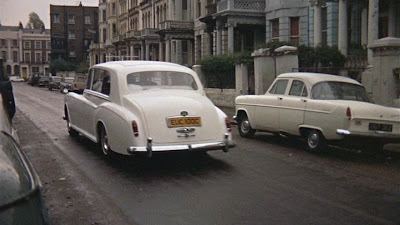 ); and the white Rolls-Royce belonging to John Lennon used in the last sequence. Since the issue has come up in the past, and since there may be others who haven't written me but who also think we are incorrect, I thought I'd address it, and settle the matter once and for all. 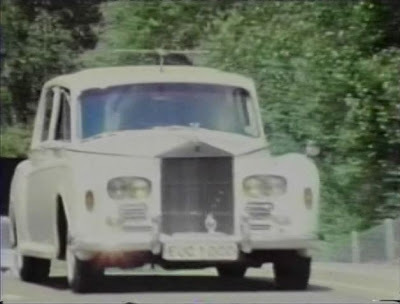 I've included below a series of frame grabs from the final moments of Performance in order to fully reveal the identity of the Rolls-Royce used in the last sequence of the film. 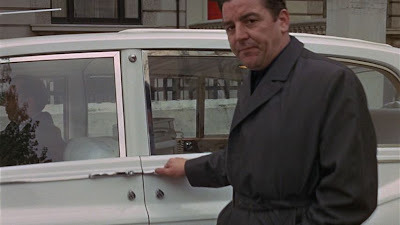 I should also add that David Cammell, the film's Associate Producer, told us that it was John Lennon's car, so I hope that all of this is proof enough that our assertion in our book about the identity of the white Rolls-Royce is correct. The equipment in Turner's "studio" was also borrowed from the Beatles' Abbey Road studio, with the exception of the Moog Series III synthesizer, which was brought over by Jon Weiss, a representative of Moog at the time. In a subsequent blog I'll discuss what happened to the Moog synthesizer that was used in Performance. The provenance of contenders for John Lennon's (first?) white Phantom V can be checked by inspecting the tailshaft bracket for a welded repair job (done in March 1969). Could also check the universal joints for external abrasions. If "yes" to EITHER of the above, then THAT's the car. If "no" to BOTH of the above, then either: i) that's not the car; or ii) it is the car, but the bracket and universal joint might have been replaced after the 1969 running repair. Check if the bracket and/or universal are original or a replacement. If a replacement, then THAT's probably the car.